The flight management systems market is projected to grow from USD 2.31 Billion in 2016 to USD 3.13 Billion by 2021, at a CAGR of 6.23% during the forecast period of 2016 to 2021. The market for market is driven by various factors, such as rise in aircraft orders globally, significant growth in airline industry worldwide, development of glass cockpits resulting in better operational efficiency, among others. This report covers the forecast of the flight management systems market and its dynamics over the next five years, while also recognizing market applications, evolving technologies, recent developments in the market, and high potential geographic regions and countries. The base year considered for the study is 2015 and the forecast period is from 2016 to 2021. The report analyzes the market on the basis of fit (line fit and retrofit), hardware (visual display unit, control display unit, flight management computers), aircraft type (narrow body aircraft, wide body aircraft, very large aircraft, regional transport aircraft) and maps these segments and subsegments across major regions worldwide, namely, North America, Europe, Asia-Pacific, the Middle East, Latin America, and Africa. The report provides in-depth market intelligence regarding market dynamics and major factors that influence the growth of the global flight management systems market (drivers, restraints, opportunities, and industry-specific challenges), along with analyzing micromarkets with respect to individual growth trends, future prospects, and their contribution to the overall flight market. The report also covers competitive developments such as long-term contracts, joint ventures, mergers & acquisitions, new product launches and developments, and research & development activities in the global flight management systems market, in addition to the strategies adopted by key market players. 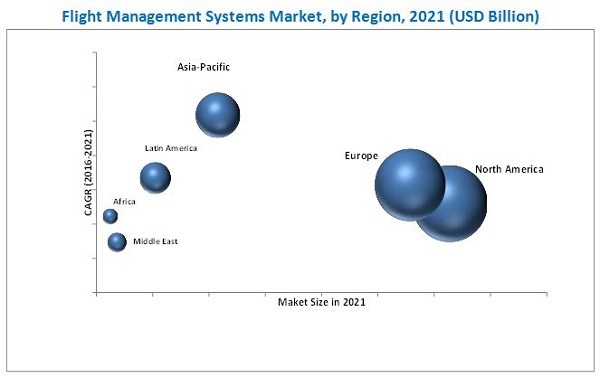 The flight management systems market ecosystem comprises of software/hardware/ service and solution providers, manufacturers, distributors, and end users. Some of the key players of the market include Honeywell International Inc. (U.S.), Thales Group (France), General Electric Company (U.S.), Leonardo-Finmeccanica S.p.A (Italy), Rockwell Collins (U.S.), Esterline Technologies (U.S.), Garmin Ltd. (Switzerland), Universal Avionics Systems (U.S.), Lufthansa Systems (Germany), Jeppesen Sanderson, Inc. (U.S.), and Navtech, Inc. (Canada). These players are adopting various strategies, such as agreements and partnerships, new product developments, contracts, and expansion to strengthen their positions in the flight management systems market. They are also focusing on the development of new products with higher precision and reduced weight, by investing considerable amount of their revenue into R&D.